Ready to eat. Eat soon after opening. Ingredients: Seaweed (Laver) (97%), Corn Oil, Sesame Oil, Salt. 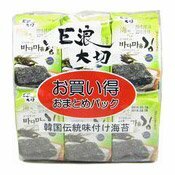 Simply enter your details below and we will send you an e-mail when “Seasoned Seaweed Multipack (Laver) (紫菜小食)” is back in stock!